Each year, Chemical Watch runs a series of more than 15 global conferences, across our Global Chemicals Regulation, Asia Chemicals Regulation and Biocides Regulation event series. But did you know that we also offer the opportunity for you to exhibit at or sponsor these events? Taking place in Asia, Europe and the USA, our annual series of events provide an ideal opportunity for you to promote your product in front of your target customers. 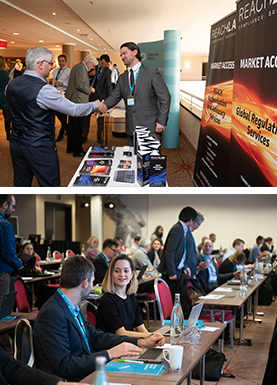 Our up-to-the-minute programmes and world-class speakers attract the very highest calibre of delegates, including upstream and downstream users, regulators, advisors, competent authorities and formulators. Why exhibit at our events? Direct access to your target customers - our up-to-the-minute programmes and world-class speakers attract the very highest calibre of delegates. Stand out from the crowd - limited exhibitor spaces offer an opportunity to focus all eyes on your brand, rather than your competitors. Pick and mix to suit your specific needs - choose from a rich programme of events throughout the year, spanning the globe and tackling a wide range of relevant topics. Benefit from ongoing promotion by Chemical Watch - sustained campaigns of promotional activity in the run-up to events put your brand directly in front of our 29,000-strong community. Affordable packages - complete exhibitor solutions with no hidden extras - all supported by our dedicated events team. VAT: Orders from UK-based organisations will incur VAT (sales tax) at 20%. Business customers in other EU countries should account for VAT themselves (reverse charging procedure). Orders from outside the EU are not liable to VAT.